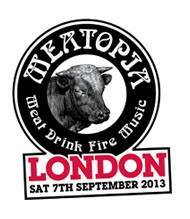 Meatopia is a one day festival of meat & barbecueing, taking place at Tobacco Dock in Wapping on Saturday 7th September. See below to see all the star names from the UK who will be there - Pitt Cue, St John, Moro, Tayyabs even (really exciting that one! ), and also lots of others from around the world, including from Tuscany, Dallas, and New York. It's not cheap - tickets start at £47 - but for the meat lover it is unmissable! "Over the years, us Brits have given plenty to our American cousins. David Beckham, Cary Grant…their freedom. Because of that history of generosity, we have no qualms about now taking from them and so it is with great pleasure that we announce that Meatopia – an annual food event in New York City – is now coming to Tobacco Dock, London. The brainchild of TIME Magazine food columnist and James Beard award-winning food writer Josh Ozersky, Meatopia is an acclaimed food festival for discerning carnivores, brought to you in London for the very first time by Turner & George. 2012 saw the event leave New York for the first time when San Francisco hosted dozens of world-class chefs cooking the country’s best cuts of meat over live fires, while live music entertained the masses all enjoying cold beers and the best in aged spirits. This September, it is London’s turn. The Wild Game Co.The Wild Game Co.